You may be reading more and more about the revolutionizing of the real estate business and how instant offers are the holy grail. Do I favor the change - generally, NO. However, I am open minded and fully agree that in some circumstances instant offers may be a viable option. So - why am I generally not in favor. For those who do not yet know my background, mine was a high-level corporate career. I understand business - and making money. Think about it - a house is worth X. These instant offers are not going to equal X or the companies would make no profit. So they buy for less than X - and then they still have the expenses of selling your house - they are not looking to live there. And, who do you think they hire to sell the house for them - and list it in the MLS? Now they have to cover the investment time of holding the house and the cost of selling it. And, they are not likely to want to hold on to it a long time or that will cost them. They consider all of that when making the offer. Oh - wait - besides all those expenses they have to cover - they want to make a PROFIT. So, go back and start with X. Then subtract all those things just mentioned. Who do you think pays for it? They convince you that you will have no worry or headaches. Pack the truck and the car and just go. At what cost? 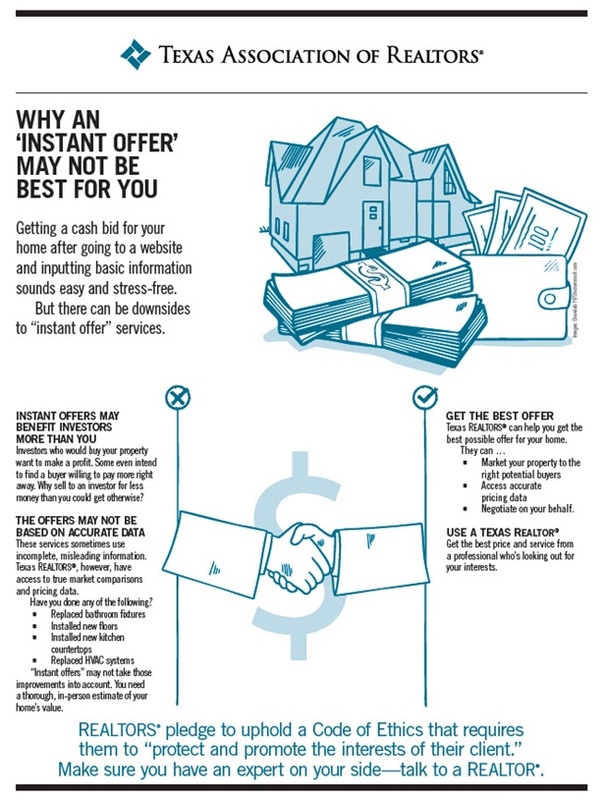 Yes, REALTORS do charge a fee. But, our job is to get you the MOST money for your house. Above, I said I was open minded - and I am. If you do not need to maximize what you walk away with on your house - fine. If you do not want the most earnings on your investment - fine. If you inherited Aunt Susie's old house and don't care because it is just extra money you would not have had anyway - fine.